With a little clever photography, I could claim that my Bead Soup piece is complete, combining right angle weave 'links' with the lovely sea glass bezels and fused glass focal created by my fabulous swap partner Kimberly Roberts. I definitely finished enough to get a feel for the final piece. But the truth of the matter is, it's not yet done. Late arrivals of my soup mix due to hurricane Irene, unexpected time requirements in my other work and design challenges all left me really running behind on this one. If it hadn't been for the need to follow through to show Kimberly's pieces, I might have thrown in the towel. The large, square, transparent glass focal was a real challenge for me. The shape didn't lend itself to my more organic stitching, and I wrestled with the issue of transparency - do I bead behind it or do I let it stand alone? I considered creating a solid freeform peyote collar, with beading behind to provide a backdrop for the focal, but it just didn't feel right. Too heavy and solid for the focal bead. I finally decided to echo the open feel and shape of the focal with my right angle weave links. 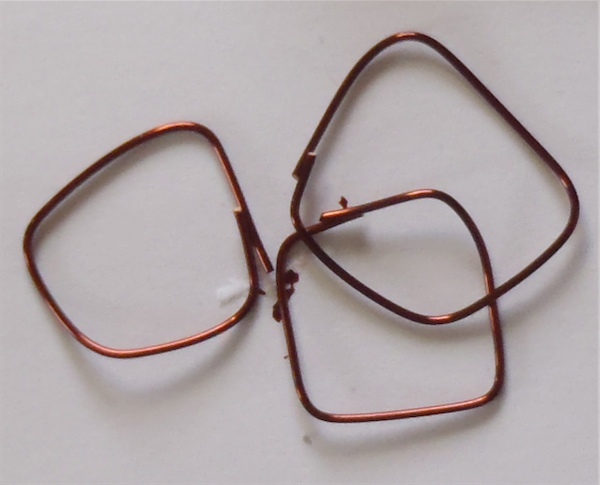 Each link is stitched around a 20 gauge wire core to give it strength and stability. I taped the ends with acid-free artists' tape and then painted the tape with a little acrylic to help it blend (the white tape would have shown through the bead work). For each link I worked three rows of right angle weave the length of the circumference, like a long narrow ribbon. And then I'd lace it closed around the wire, pinching it into shape as I went. I'd originally thought I'd use the sea glass bezels in a separate piece, but when I laid them out amongst the links they looked right, so they were added in as well. When the piece is complete, the links will graduate smaller around the neck. There's more, but it doesn't look as complete! What you've done looks great! The beaded links are wonderful and I think they do set off the fused focal! Would love to see what it looks like finished... around someones neck! Thanks Lynne! So do I - can't wait to see it finished. I will post additional pics when it is, and around someone's neck, too. Karen, I still think you stayed true to your organic style with this. I love those links! So, was the hole in the focal wide enough for a strand of RAW? It looks like it goes right thru it. The colors you chose are beautiful! WOW Karen -- you never cease to amaze me with your fabulous creations. 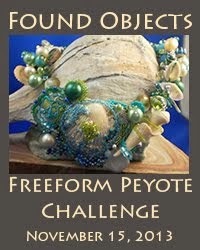 I love what you did with the beaded wires and big shapes -- it creates a sort of "Pop Art" feeling to the piece. 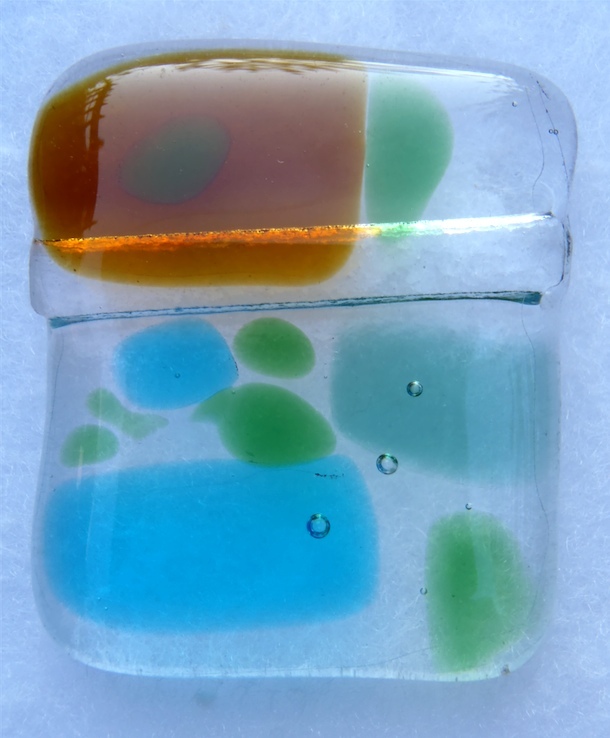 Love the colors too -- this piece rocks!!! OMG Karen what a fantastic piece! Your use of the seeds in those links is truly unique and outstanding! 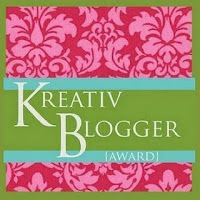 Those links you've created are great and such a wonderful compliment to the focal piece. Karen!!! i love it!!!! 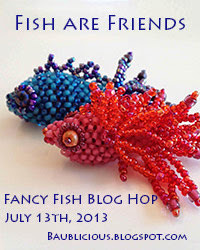 i just love what you do with seed beads and wish i had that patience!!! those pieces are perfect for that focal!!! thanks for being my partner!. I think you did an OUTSTANDING job and trust me -- after tearing up my piece three times, I thought I'd never get done, and I had that hurricane, countless migraines, school starting, more emails than I EVER thought I'd have, and a show in the middle of all this. You did far better than I did. Oh boy with my luck and seed beads I would still have a pile. You have my admiration for using these little missels. You have created some beautiful links. I'm so glad you posted your soup. Even though it's not totally finished, it's done enough that we can see what the end result will be. A STUNNER. I love too that you included your failed first attempt and shots of how you are making those outstanding beaded components. Really, Great GREAT job! 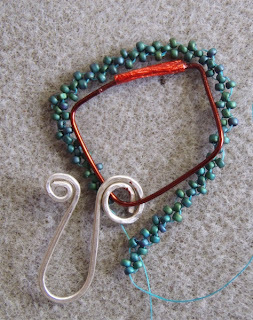 I think that necklace will be stunning when it is finished...I can already see that it is! What a lot of work those little beads are...I admire anyone who can have the patience and fortitude! to work with them Please show us when it is finished as I would love to see it. Shirley - yes, a single strand of right angle weave fit absolutely perfectly through the focal's beading hole. Which was great because it provides more support, and I love the patterned effect through the glass. Oh, Karen! I love your book! I have had it for maybe a year and have used it alot. It is the best written easiest to follow book I have ever used! It has given me wings! 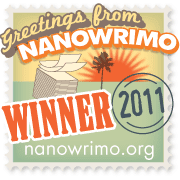 thank you for writing it. Your design is so very unique and original. It's definitely a one of a kind! I totally dig it myself and know that it's not something that would have occurred to me. Of course, I'm no good with the beadwork. Yours is fab. Wonderful work! i LOVE what is going on in this!!! 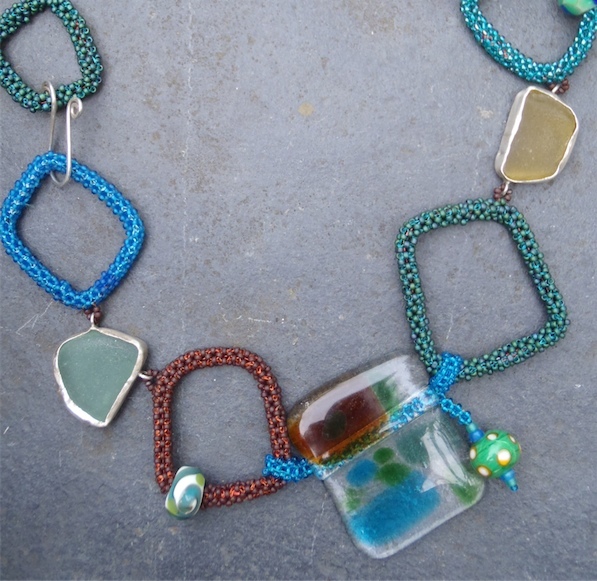 i love the beadweaving and the sea glass and the focal! fantastic work! i collect river rocks obsessively and small pieces of driftwood and anything really. 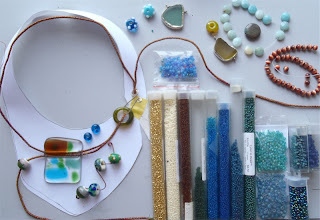 some items are making it into jewelry...so much fun making nature (seaglass becomes nature, doesn't it?) wearable! just love your design process, it is such a stunning focal and those can be the trickiest of all to incorporate into a wearable piece. You really did an awesome job! Oh, I'm sure the finished necklace will be great! You already spent a lot of effort on it, and I like what I can see so far! Interesting beaded links. Looking forward to seeing it finished. I really like what You have doen so far !! That focal would have given me pause as well!! You are off to an amazing start. What a beautiful piece you are creating! Nice, great work on those links! 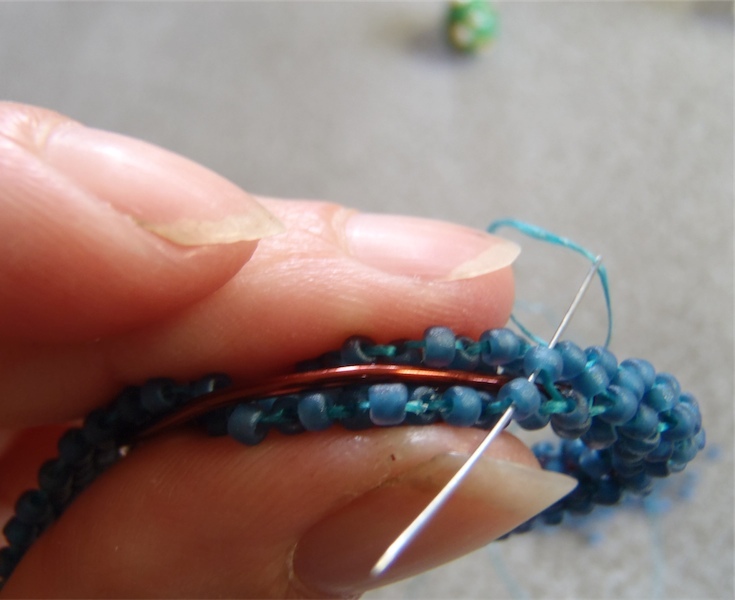 I am just amazed at those of you who can stitch with beads! You're on the way to a great design here! So wonderful! 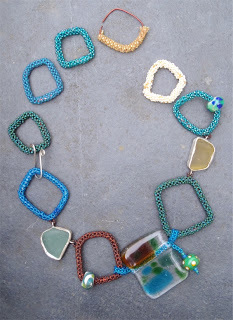 I love bright colors, geometric shapes, and beadweaving, so this really floats my boat! and I really appreciate your tip about putting the wire inside the loop! 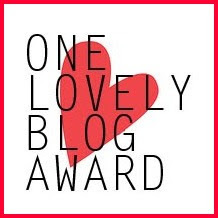 Lovely work, and there's a lot of it there. To have constructed each of those links is a feat. I'll make sure I checck back when it's done and thumbs up on creativity for working outside your usual zone. It looks great! Love the bright colors and neat shapes! Wow! This is really incredible! I LOVE the links that you made. It's just perfect! A fantastic design I love the beaded links and the little dangle from the focal is so cute and the fantastic photos show you you did it! A really unique and one-of-a-kind piece, lovely! Wonderful! 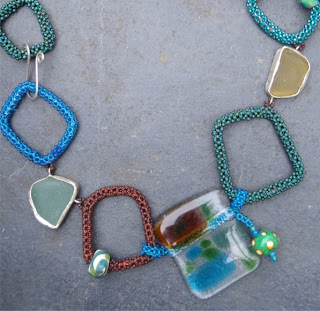 I like your use of color and texture, and I love the bead weaving. Thank you for sharing your artistic process along the way. Cheers! What a luscious focal, and I love your response to it. 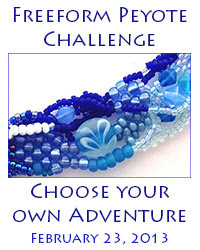 The seed beads you chose set the perfect tone - looks like you plucked your colors from the sea. This is going to be amazing when it's finished! So far it looks great. I like your seed bead stitching to hang the focal. 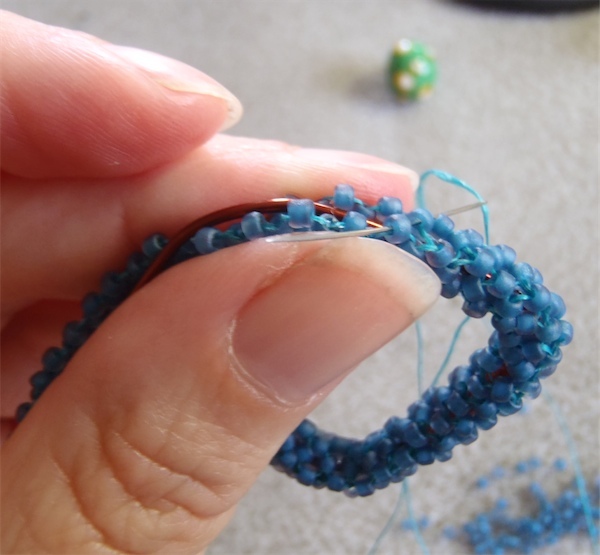 (I can't do seed beads) The little dangles on some of your other bead links are cute. Can't wait to see it done. Very unique. What a great design idea to do the seed bead links. life happens! what you have done so far looks wonderful! So far so fabulous! Keep it up! You have a patience I do not, I rarely use seed beads LOL. You are awesome! What a great design! I can tell the finished piece will be smashing! Thanks for sharing the process too! When you're finished it's going to look fantastic, great job so far! This is an area of beading that I'm not willing to step into so I admire those who like to do it. I can see you have a very unique design and some serious beading skills. Soup-er job so far!!! I love absolutely everything about this - and it's great to see another weaver on the hop. Your idea of using wire as an armature for the shapes is genius! Delicious, organic, wonderful necklace! Beautiful and fun necklace! I'm impressed with your beadwork! What a gorgeous necklace! I know this is one that I will definitely remember from this round of the BSBP...it is truly unique and I can really appreciate all of the planning you put in to it! I alway enjoy seed bead work, and you truly rocked your design. The way you added some step by step photos along the way was great - a good insight in to the process of designing this piece (rather complex so this was helpful!). Your necklace is a real stunner! Cool and creative necklace! I love those irregular beaded links. Fab job! Underdone, maybe, but it's a beautiful piece in progress! I loved seeing the different stages of the process. Beautiful design, color and use of your soup! Oh! I love those beaded links!! Great Work and a beautiful necklace! It's beautiful, complete or not! I love the beaded links! You've had a lot done by the deadline and it looks great. Plus you showed your process which is very interesting. Your piece is so fascinating! I love the photos you've taken and the not so finished piece! I love this, and the work in progress photos are great. I love the idea of beading around the copper rings. I hope you'll have a chance to post a picture of it when you've had time to complete it. The idea to echo the feeling and the shape of the focal was great and made yout necklace an original piece.